The Wedgwood company is a British pottery firm, originally founded by Josiah Wedgwood c1795, and possibly the most famous name ever associated with pottery. In modern times Wedgwood merged with Waterford Crystal in 1987 to become Waterford Wedgwood. The original manufactory was a pioneer of new products such as those modelled by William Greatbach, and those coloured with lead glazes developed by Josiah Wedgwood during his partnership with the Staffordshire potter Thomas whieldon. Other landmarks include a fine red stoneware known as rosso antico, black basaltes and the jasperware that came to be the company’s best-known product. By the mid-18thC antique Wedgwood products ranged from brooches and snuffboxes to statuettes, plaques and tablewares. It was widely copied and it exported all over Europe and the USA. The company’s success in the 18thC carried through into the 19thC, when the emphasis shifted from handcrafted pottery to the production of bone china and majolica. Wedgwood 20thC designers included Keith Murray, CFA Voysey and Eric Ravilious. He founded the wedgwood company and many of his descendants were closely involved in the management of the company. Right down to the time of the merger with the Waterford Company. Wedgwood was a constant innovator, a thinker, and a scientist. In 1782 he perfected a tool for measuring heat in kilns. On the basis of his work Wedgwood was elected to the Royal Society in 1783. The first major innovation Wedgwood introduced to the pottery field was the development of Queen’s Ware, a cream-coloured, lead-glazed earthenware. This was durable china formed with a mixture of flint and white clay. In 1765 Wedgwood provided a tea service in this new material for Queen Charlotte, wife of George III. She was so pleased with it that she gave Wedgwood permission to call it Queens Ware, and to style himself, “Potter to Her Majesty”. Queens Ware became an enormous success and spread the name of Wedgwood across all of Europe. Today Queens Ware is highly collectable and very affordable. 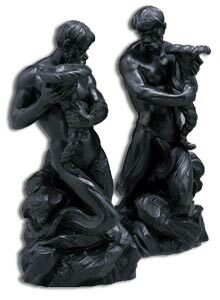 In 1768 Wedgwood developed a fine black porcelain called Black Basalt. With this fine-grained stoneware he was able to produce copies of the newly excavated Etruscan pottery from Italy. The new innovation proved another huge commercial success. The surface was lustrous and smooth, with a purple-black sheen. Wedgwood’s factory could scarcely keep up with the demand for candlesticks, medallions, tableware, and vases in the material. The third major innovation for which Wedgwood is remembered is Jasper Ware, which has been described as the most important invention in the history of ceramics since the discovery of porcelain. It took Wedgwood years of experimentation to perfect his design for this unglazed stoneware with the uncanny ability to be both durable and delicate, and to take colours so evenly throughout its surface. Jasper can be almost any colour, although the most famous examples are are pale or dark blue and white. The new material was used in an astonishing array of objects, including, of all things, a grand piano. Jasper Ware is also famous for the bas relief applied to the sides, often in imitation of classical Greek motifs. Jasper Ware has been in production for over 200 years, and in that time the methods of production have remained virually unchanged. It would seem that Josiah Wedgwood got it right first time. John Wedgwood (1766–1844) eldest son of Josiah I, partner from 1790 to 1793, again from 1800 to 1812. 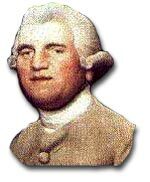 Josiah Wedgwood II (1769-1843) second son of Josiah I, succeeded his father as proprietor in 1795 and introduced the production of Wedgwood bone china. Josiah Wedgwood III (1795-1880) son of Josiah II, partner from 1825 until he retired in 1842. Francis Wedgwood (1800-1880) son of Josiah II, a partner from 1827 and sole proprietor following his father’s death until joined by his own sons. Financial difficulties caused him to offer the firm and the family home etruria hall, for sale soon after taking over the factory but fortunately for the company, only the hall was sold. He continued as senior partner until his retirement to Barlaston Hall in 1876. Godfrey Wedgwood (1833-1905) son of Francis Wedgwood, partner from 1859 to 1891. He and his brothers reintroduced bone china c1876 and employed of the artists Thomas Allen and Emile Lessore. Clement Wedgwood (1840-1889) son of Francis Wedgwood, partner. Laurence Wedgwood (1844-1913) son of Francis Wedgwood, partner. Major Cecil Wedgwood DSO (1863-1916) son of Godfrey Wedgwood, partner from 1884, first Mayor of the federated County Borough of Stoke-on-Trent (1910-1911). Chairman and managing director of Wedgwood until his death in battle in 1916. Kennard Laurence Wedgwood (1873-1949) son of Laurence Wedgwood, partner. In 1906 he went to the United States and set up the firm’s New York office, which became Josiah Wedgwood and Sons USA, an incorporated subsidiary, in 1919. Francis Hamilton Wedgwood (1867-1930) eldest son of Clement Wedgwood, chairman and managing director from 1916 until his sudden death in 1930. Josiah Wedgwood 1st Baron Wedgwood (Josiah Wedgwood IV), (1872-1943) — son of Clement Wedgwood. He was a distinguished Labour Party (UK) politician and Member of Parliament for Newcastle-under-Lyme for 36 years until elevated to a seat on the Labour benches in the House of Lords by Winston Churchill in 1942. Josiah Wedgwood V (1899-1968) son of Josiah Wedgwood IV, the Managing Director of the firm from 1930 until 1968 and credited with turning the company’s fortunes around. He was responsible for the enlightened decision to move production to a modern purpose built factory in a rural setting at Barlaston. It was designed by Keith Murray in 1936 and built between 1938 and 1940. He was succeeded as managing director by Arthur Bryan who was the first non-member of the Wedgwood family to run the firm. Is it Genuine Antique Wedgwood Porcelain. The antique Wedgwood Collector is faced with many imitators and unscrupulous rival manufacturers. 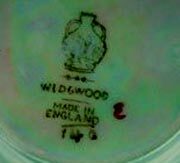 Who either traded on a relationship to the Wedgwood family by marking their wares so that the ill informed might buy them thinking they were Wedgwood quality or left their products unmarked so that the buyer might attribute their work to the Wedgwood potteries. Some of the imitators’ work is quite good and would happily grace a fine collection of 18th and 19th century English potters work. Rather than easily copied potters marks like the crossed sword mark used by meissen or the sevres double L or the chelsea potteries’ anchor mark. Josiah was also quick to defend his marks and reputation in court during his lifetime and his successors have followed that pattern to the present day. an indicator of its true age. Significant dates in Wedgwood company history. 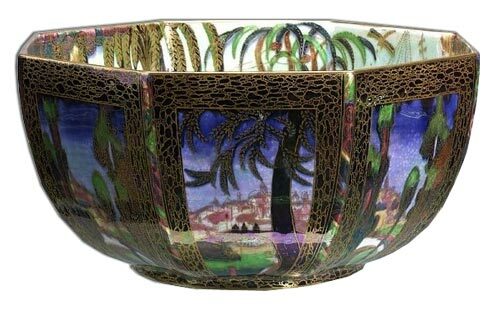 1806 – Antique Wedgwood Lustre ware glaze introduced. 1812 – First printed mark used. 1860 – Wedgwood majolica introduced. 1953 – royal blue jasper ware introduced to celebrate Queen Elizabeths coronation. 1980 – 250th anniversary of the birth of Josiah I.